Combine yeast and milk in medium bowl and allow to sit for 5-10 minutes, until foamy. Stir in 1 cup of flour and cover with plastic wrap. Let sit at room temperature for 30 minutes. In bowl of electric mixer, beat butter until soft and fluffy, about 2 minutes. Add sugar and beat another 2 minutes. Add eggs, one at a time, beating well after each addition. Beat in rested yeast mixture, vanilla and additional 3 1/2 cups of flour, one tablespoon at a time. Beat until smooth dough forms. Cover bowl with clean kitchen towel and allow to rise until doubled in size, 1-2 hours. Line sheet pan with parchment paper. Sprinkle lightly with flour. When ready to roll out dough, lightly flour work surface and roll out dough to a 1/2-inch thickness. Using doughnut cutter or cookie cutters, cut out 3-inch-diameter rounds with 1-inch-diameter holes. Arrange doughnuts on prepared baking sheet, leaving at least 1 inch between doughnuts. Cover cut doughnuts lightly with kitchen towel. Allow to rise for about 30-50 minutes or until almost doubled in size. After 30 minutes, check to see if doughnuts are ready every 5 to 10 minutes. To test, use fingertip to lightly touch one of the doughnuts. If dough springs back immediately, it needs more time. If it springs back slowly, it’s ready. If dough doesn’t spring back at all, it’s over-proofed. You can punch down and re-roll over-proofed dough once. During last 15-20 minutes of proofing, line baking sheet with 2 layers of paper towels and place wire rack on top of towels. In heavy-bottomed large pot or deep fryer, heat at least 2 inches of oil to 360°F. 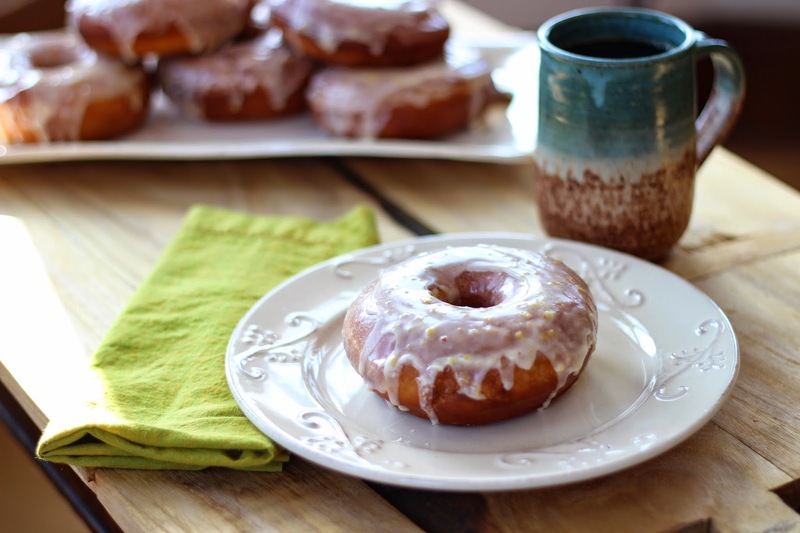 Working in batches, use slotted metal spoon or spatula to carefully place doughnuts in hot oil. Fry, flipping once, until light golden brown, 1 to 2 minutes per side. Transfer cooked doughnuts to wire rack with slotted spoon. Let doughnuts cool slightly before glazing. To make glaze, whisk together powdered sugar, lemon zest, melted butter and lemon juice until thoroughly combined. Dip warm doughnuts into glaze mixture. Flip to coat both sides, if desired. Place each glazed doughnut back on wired rack until glaze has begun to harden. Repeat process with doughnut holes.